On 28 February 2013 we took an important step toward answering two questions about the history of the log side of the Stone House. The first of these two questions stemmed from the physical evidence in the logs themselves. Did this evidence indicate that the log side of the house had been raised from a shorter height to its current height by adding additional courses of logs at some point in its history? If so, when was this done? 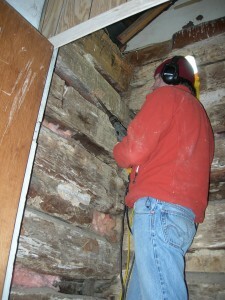 To answer these questions we called upon our historic structures consultant Douglass Reed of Preservation Associates, Inc. After an initial visit on 11 February wherein he determined that there was sufficient reason to proceed, Mr. Reed arranged for Michael Worthington of Oxford Tree-Ring Laboratory in Baltimore, Maryland to come and drill core samples from logs in key areas of the exterior walls of the structure. Mr. Worthington is a specialist at dating historic buildings. He formerly was a partner at the Oxford Dendrochronology Laboratory in the United Kingdom but has since started his own business after moving to the United States. After drilling the samples during his site visit on 28 February, Mr. Worthington then took them to his lab for analysis. 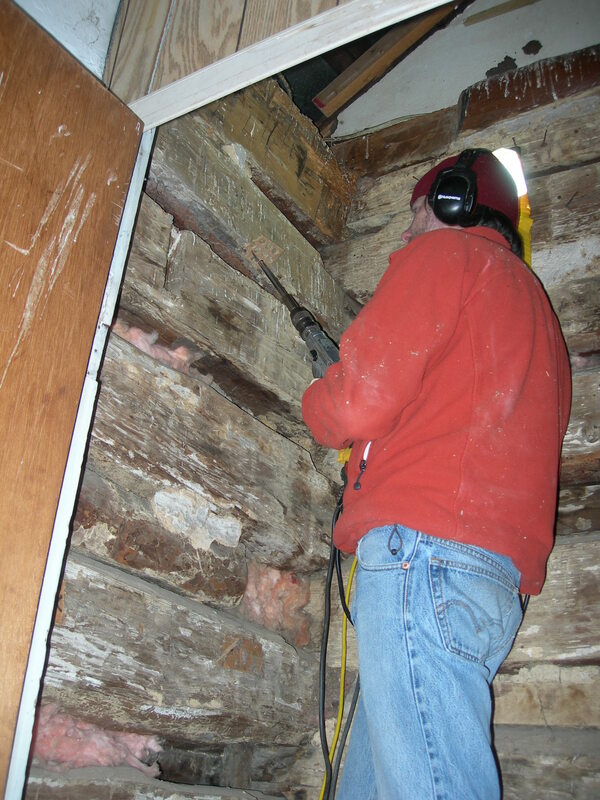 The key to dating a structure with dendrochronology involves a number of key elements and is based on certain assumptions. For instance, all the trees in the lower Shenandoah Valley that grew in the years between 1700 and 1770 experienced the same weather and climate. Thus they all grew faster during warm, wet years and slower during cool, dry years. When dendrochronologists look at samples of white oak trees that grew in this region during that period, they see the same alternating pattern of growth rings. By linking this region’s pattern with established climate data for the specific years, it becomes possible to calculate when a tree started to grow and when it was cut down or “felled.” When dating a log in a structure, not only is it critical to take the core samples from the right places in the building (so that you are testing wood that is from the oldest parts of the house), you also need enough samples with both the outside bark edge and at least fifty years of growth rings. This is because samples taken from your structure need to be compared against other dated tree-ring patterns, and there is too much room for statistical error when using fewer than fifty rings. It is also important to note that dating an old tree is only possible if you can match up its growth ring patterns with those in other trees with known felling dates. When all these factors are taken into consideration and applied correctly, it becomes possible to date logs from a historic structure. Fortunately there were enough logs that could be sampled from our structure with both a bark edge and at least fifty years of growth rings to compare against the available historical tree-ring databases for our region. When the test results came back, we found the answers to our questions were as Mr. Reed predicted. There were two periods represented in the structure. The felling dates for the logs of the first floor and half way up the second were from the winter of 1785 through the spring of 1786. The second phase of construction that raised the height of the log side to its present level began with the felling of trees in the winter of 1803-1804. Thus, we now know that the log side was added to the stone side by Peter Upp in 1786 and that its roof ridge was originally the same height as that of the stone side. Then, after the property was purchased by Henry Jackson in 1802, the log side was raised to its current height in 1804 by workers adding several more courses of logs to the top of what had already been built in 1786. This confirmed what we had suspected based on the physical evidence in the structure itself and the other documentary evidence in the deeds associated with the property.